What would be the best amp for my dog? 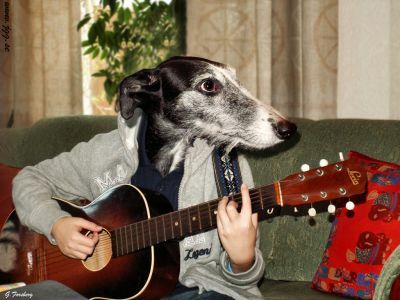 Discussion in 'Amps and Cabs' started by echo44, Jun 10, 2008.
check this out my dogs first attempt to play guitar! Today were going to try with effects! How about an alessandro working dog? The dog has killer chops. He deserves the handwired Marshall Jimi Hendrix reissue stack. Get him a vocal coach though please. His voice is a bit raspy. The Youtube video explains those unusual relicing patterns found on some guitars. I can't even imagine how much that would scratch up your guitar. Dude!!! You cracked me up! LOL! Love it! I think your dog needs a Marshall Come on man, dial up some dirt for that pooch! That's a great video. I love dogs!!! Allesandro should add a "Border Collie" to its line of dog name amps haha! your dog needs a "woofer" speaker. 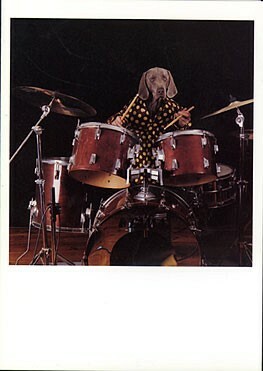 dog's smarter than my band's old bass player....did I type that out loud? What a great video! With all the ranting and arguing that goes on around here, this was a breath of fresh air to watch! An old plexi should have the right amount of 'bark'. Maybe check your local PAWn shops.